Active WebCam software captures images up to 30 frames per second from any video device including USB, web cameras, TV-boards, camcorders, and from network IP cameras. This camera software performs simultaneous recording and broadcasting from unlimited number of cameras. Stream Video and Audio through Web Server - you can watch video from surveillance computer even if this computer completely protected by firewall. Also this service provides high frame-rate broadcasting to the unlimited auditory because broadcasting is performed from our web server which has high speed broadband connection. HTTP Server - web camera software runs own HTTP server that all users, connected to your computer, can watch your cameras and play back recorded video files. FTP Upload - the program uploads images to your web site using FTP protocol. Your viewers point Internet browsers to your web site and watch captured video. The captured video can be viewed using any Internet browser. 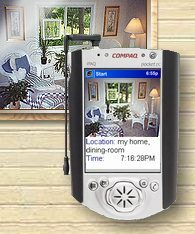 Your camera can be used as a Surveillance System to watch your home, office, children, pets or anything else. You can shrink, grow, and rotate captured images. You can use Active WebCam to record full-motion clips from your video and audio sources. The program has the following recording features: Live Recording, Archive Recording, and ability to create Archive of Snapshots. With Live Recording the program records video and audio content constantly that allows you pause, fast-forward, and rewind live video from camera at any time. The Archive Recording is performed by user or as a scheduled task. The video and audio content is streamed into a file on your hard disk. Archive of Snapshots is a sequence of still images captured with a predefined time interval. The recorded files can be password protected that all video and audio information are scrambled and the file can be played with a valid password only. Works with all USB and Parallel Port cameras, Windows compatible Capture Devices and Framegrabbers, Pico 2000, TV-boards, and with Network IP Cameras from famous manufacturers like Toshiba, Logitech, Microsoft, Lenovo, Creative and Philips. Broadcasts live MPEG-4 video and MP3 audio up to 30 frames per second. Sends e-mail and SMS when motion detected.